You will occasionally see true “wisdom” even in the most silly, or maudlin, movie. In this case, it’s the original “Karate Kid”. 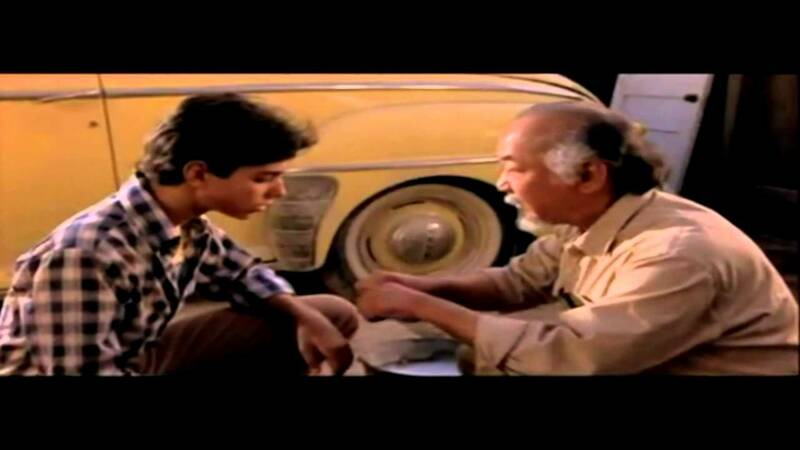 And I think Mr. Miyagi’s discussion about how to not get “the squish just like grape” applies to the topic of infidelity and marital recovery. In fact, it’s good advice for many things in life, to be honest. Cheaters: You must choose a path in life. You can’t try and run the double life — marriage and affair going on — and hope that it all works out. Sooner or later, you too will get “the squish” trying to navigate your life between spouse and lover. It will blow up in your face most of the time, if not erode your psyche from within. To those Betrayed: You must choose a path. If you really do not wish to forgive and recover your marriage, then do yourself and your spouse a favor and release them. Divorce. Trying to navigate between “punishment” and “reconciliation” does not work. You cannot pursue justice and forgiveness at the same time. You can’t take the middle road. You must choose one path or the other. Life is too short to do otherwise. ← Do People Happy in Their Marriages Have Affairs Too? I agree with the comment to the BS. You can never reconcile if you try to punish at the same time. When one is being punished constantly it doesn’t allow for equal ground. However, I find your comment to cheaters interesting…there are many men (I say men, because I think they do this more because I think woman are more likely to leave their marriages or end the affair after a lot of time) who enter into long term affairs for years and years and seem quite content having the double life. Have you noticed that too? Or gotten comments about it from readers. It seems from the literature I’ve read it is the OW who typically starts to push for more that causes an imbalance that then strains the affair relationship and MM. However, if the OW can find balance and peace in the relationship the affair could continue for years indefinitely, and the MM seem happy with that arrangement, unless the affair is discovered. I ask, because maybe I’m wrong but that is the impression I got from literature I’ve read, comments from readers, and reading blogs. Just curious about your perspective on that. I think a lot of OW fear that…MM say they will leave, nothing changes for months…then the dance starts of going back and forth. Until they either settle into a place of acceptance, the OW leaves, or the affair is discovered. In some cases the MM says he isn’t leaving, but they AP starts to grow closer, intimacy develops and they want more and can’t get it, so she leaves, or accepts it, or the affair is dispcovered. Those are the two overwhelming patterns I’ve noticed. Do you agree? Well, my research tells me that relatively few affairs are long term. Most end within a few months. But there are certainly people (not just men) who DO lead a double-life and can do it successfully. But what I also think is this: A lot of cheaters THINK they can lead the double-life, but over time, it erodes their psyche. It’s stressful. Or they get caught and it blows up. And inevitably, as much as you think you can keep “everything cool at home” and have a lover, I think a lot of cheaters find that the longer they are in the affair, the harder it is to hide it. The harder it is to be “happy” at home (and most weren’t that happy to start with). The harder it is to navigate between spouse and lover and hold it altogether. I think that’s what I’m getting at here. The double-life rarely “works”. You’d have to be in a truly loveless marriage that’s a partnership and your spouse doesn’t really care about your comings and goings, and be a narcissist, to really lead the double-life for a long time and not have it affect you in a profound way. Few people really are made “happy” by an affair. Not for long anyway. It’s the rare case where someone is perfectly content, and safe, doing this. And really it’s the true narcissist, which is frankly not the common person in the affair. Me personally? I led the double-life. For a couple years. I was never fully comfortable in it. I couldn’t seem to bring myself to stop the affair, but I was always stressed out. Always nervous. I was driving myself crazy trying to figure out what to do. And yes, I agree. There are some cheaters — especially the male ones — who are far more likely to be content with the relationship, and string their lovers along with vague promises. The male cheater rarely wants more. The female partner in an affair — married or single — more often than not wants to take it to the next level. I agree with that. But even when the MM in an affair is content with the arrangement, it doesn’t mean that for most it really will “work” in the long-term. Something inevitably happens and they often find their lives (and psyches) thrown into chaos by trying to live the double-life. Thanks for the reply. I have been involved with a MM for 16 months now. At first I didn’t know he was married, but then when he tried to end things (the ending didn’t make sense we were so close) I did some digging and found out he was married. He said the relationship between us changed him. There in the first few months after I discovered he was married, it did seem he was serious about leaving his wife. I told him he had to leave, I had no desire to be his OW. He went to an attorney, spoke to his family and friends. He seemed like he was making progress. Then he suddenly put the brakes on. When it came time to pull the trigger he couldn’t. He still contends that he is leaving and he wants to be married to me, but I haven’t seen any real big gesture to make me believe this will be anytime soon. I don’t believe he is a narcissist (I have degrees in psych and soc), but I don’t really see any true remorse on what this does to me, how it affects me, his wife (I think he thinks shes not affected, though you and I both know that even if she is in the dark it still affects the marriage) and he doesn’t talk about being stressed out by the affair or balancing his home life with the affair. He seems content. In fact, he says I make him happier than he has ever been. He is always beaming when I see him. He said that his family and friends have noticed how happy he is since he has met me. He says his marriage is truly dead, perhaps it is. With the way he is in constant contact with me I can’t believe he hasn’t gotten caught yet. It’s been almost a year and half. And maybe I am misled, because of all the OW blogs I follow and chat with, but I just noticed that common theme. Maybe it is just that women who have these long term affairs are more likely to blog about it as an outlet. I have read too that most affairs are short term. I am just frustrated today. I find that even that passes though. Did your AP know how uncomfortable you were with your affair? And what stopped you from ending it? I’ve heard about men like these before. I have traded many emails with a lady who is in a similar circumstance to you. I’ve tried to tell her that its very unlikely he will leave his wife for her. That he has actually been pretty honest with her and that no amount of her efforts are likely to dislodge him from his cushy situation. He is utterly content with keeping her exactly where she is. And she is frustrated. But that’s her choice. Just like it’s yours. Yes, it would be typical for this kind of cheater to string his lover along. Not necessarily on purpose. Although some do. But for others, like me, I was in a true dilemma. When I actually got to the edge of the abyss and looked over the side, I pulled back. And started to talk to me my wife. I started to feel our intimacy creeping back in and I was back on the fence. Some days I felt like I was going to leave my wife, and other days I did not. And yes, I told my lover that. Repeatedly. She knew how stressed I was and how torn I was, but tried to only remember the times when I told her I was likely to leave. The rest of the information she dismissed. Then she tried to manipulate me and the situation. It backfired drastically. But that’s another story. In the end, I realized she was not an honest or very nice person. What stopped me from ending it sooner? My head. My dilemma. As I told my therapist over and over, I was like a man in a minefield -afraid to take a step in any direction. Not sure what to do. Leave my wife? Leave my lover? Leave both?? I wasn’t sure. It was awful. My indecision froze me in place. I hoped that the situation would resolve itself. And ultimately it did – the OW cowardly engineered informing my wife of the affair anonymously. And based on that, and a few other things I then found out about her, I terminated things the very next day. The decision was made for me. I knew what I had to do and that was save my marriage and family. My story is more complex than that, but that’s the basics. And so you know you probably don’t see any remorse because he is only able to think of himself and feeding his addiction right now? That he won’t pull the plug because he has both relationships pretty neatly compartmentalized in his head, and has yet to feel a strong enough need/desire to take some sort of action and choose? Until either you, or his wife, or an unanticipated person/event triggers a D-day, things could drift along like this, possibly for years, until that decision is taken out of his hands – which could be what he secretly hopes will happen anyway. I have zero behavioral science degrees, and I know instinctively that it’s a very human trait to avoid confrontations, and procrastinate acting on life-altering choices when you aren’t really convinced that you want your life to change all that badly. You could easily wake up several years from now to discover that you are indeed the OW in a long term affair that your OM never really had any concrete plans to end or make into an open and permanent relationship. It happens. And not just to the uneducated. I’m just curious – what would you advise someone else to do? I can understand why you would feel that way. In fact, I think that my degrees probably contribute to how I ended up here. You see, people with social science degrees don’t typically see things in black and white. We are taught through classes not to see human behavior and cognitions through the lens of social norms in society, but to look at the bigger picture. We are taught to look beyond the social norms. For instance, I have had several classes that look at marriage cross culturally and through thousands of centuries. We look at humans biologically with genetic predisposition and how our environment and social norms affect those behaviors and cognitions. It is the old nature vs nurture. Marriage until the last two centuries was a business arrangement. Often times pre-arranged by families as a way to obtain status and land. That old tradition of not seeing the bride before the wedding, comes from the times of arranged marriages out of fear either the bride or groom would duck out of the ceremony. Before irrigation, when humans were nomads there is a lot of evidence that humans were serial monogamous. We are species that is millions of years old, marriage is man made concept that is socially constructed and has only been around a few thousand years, and this idea of monogamy that we have today is a socially constructed concept…that we are taught…not born to live. There is a huge theory that affairs happen because biologically we are serial monogamous creatures, but live within the confines of social norms that don’t fit our natural instincts. I could go on, but this is why I don’t necessarily think my degrees would help me out in this situation, if anything it contributes. I don’t see my partner as either good or bad, but instead I see him as someone who is in difficult place, and he too is trying to figure out how he ended up here and what he is going to do. I have no doubt that if he followed his heart and didn’t have to deal social implications (social backlash, children who are angry, wife who is angry, financial hit) he would be with me. I have never doubted that. I have never questioned his love for me. There is no way he could fake that. It isn’t as easy as black and white. He has decisions he has to make, what he wants to live with in the end. I have decisions I need to make. For me pushing an utimatum, or telling the wife, or pushing him constantly are not options. The choice for him is really simple, either leave, don’t leave or continue. You might think it is really simple, weigh the pros and cons. well, for both of us there is the fear of the unknown. He doesn’t know how bad it will be if he tries to leave. It may be really awful, or it may not, but he doesn’t know until he does it, and once he does there is no going back. And for me there are a lot of unknowns too. The fear of the unknown is what holds people in places they don’t necessarily want to be, and so we are in holding pattern until one of us breaks that. I agree with your fear of confrontation, but it is also the fear of the unknown that give people pause when making a life change. I have been in this situation with a friend. I advised her to leave her husband and be with her affair partner. I listened to her, didn’t judge, told her she had my support and to follow her heart. She did and left her husband. She and her AP have been together 7 years now, and I will be standing up with her in their wedding in September. Her ex-husband is already remarried and has two more children with his new wife. The children from her marriage are doing well and are thriving in school and say they are much happier than when they lived in the house with mom and dad because of the tension. Her ex-husabnd is much happier too. I’m not saying it was easy getting to this point, but in some cases I think it is better to leave. In others, I don’t think it is. Every marriage and situation is unique. One more thing I would like to add. When a person falls in love, their entire brain chemistry changes. The decisions they make during that time are not necessarily choices they would make at other times. So, when trying to make rational judgements and decisions isn’t always easy. There are so many factors at play…social norms and biological responses…that combine to make things much more complicated. I can see this in black & white terms because I don’t have an emotional stake in your situation. I’m not talking about societal norms here. I don’t believe that loyalty is something we are socialized into. You would certainly expect loyalty from this man if he were married to you, and it would be a matter of the heart if he betrayed you. You are making assessments about his wife and their marriage through the clouded lens of your own personal feelings, and therefore, how do you know they are correct? How do you know that he isn’t deceiving you as well? You simply trust and hope, because your ultimate goal of being with him depends on it. But what does logic tell you? Should it not be saying that if he could see a clear path to an open and honest relationship, he should already be taking it? If he gave the same weight and priority to feelings as you seem to, would his actions not indicate that? “The proof is in the pudding”, as the old saying goes. Divorce can be a logistical and financial nightmare, there’s no denying that, but as you say “When a person falls in love, their entire brain chemistry changes. The decisions they make during that time are not necessarily choices they would make at other times.”. Okay, so his brain chemistry just hasn’t changed enough for him to take action? I think you should consider that marriages of convenience have become increasingly less common since the sexual revolution, and that his was most likely emotion-based. Couples become emotionally distanced by the trials and tribulations of life, and their own self-centered natures. It doesn’t mean that emotion totally dies, and certainly, the emotional needs remain. You are meeting his most important emotional needs, and so he is deeply attached to you. But his wife, and his marriage, are probably meeting some pretty important emotional needs as well, and that is also a big part of why he won’t let go. To use a Dr. Harley analogy – they have an emotional bank account, and he hasn’t so much opened a new one with you, as he has been siphoning off funds from theirs, and slipping them to you under the table. But it’s doubtful that he has completely closed it, regardless of what he tells you. You can think that you don’t love someone anymore when you stop receiving the things you need most from them, especially when someone else is giving them to you freely. But that can change drastically with something as simple as the needs no longer being filled by the someone else, or filled with conditions you don’t much care for, or by your spouse coming to a sudden realization that they need to step up and start doing their part to make their marriage better. I personally would not be willing to leave my fate to the mercy of another relationship’s dynamics. Life is short, and my value system is such that I do value love and loyalty enough to not waste the time I have with someone who does not. People can make mistakes, but they will eventually have to address them, and desire to walk the same path if they wish to walk with me.